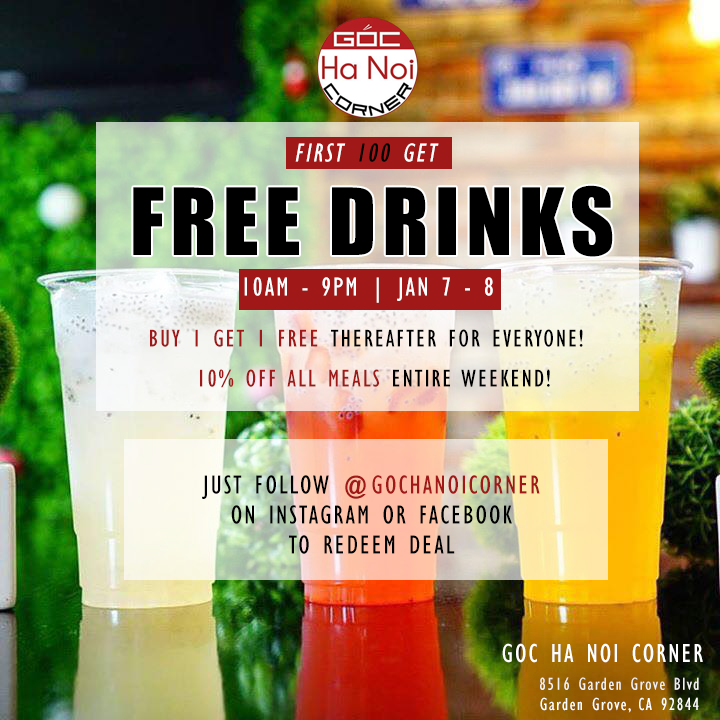 Jan 7 - 8 | Goc Ha Noi Corner Offers Free Drinks and Meal Discounts For All Customers - EAT WITH HOP! Goc Ha Noi Corner just recently opened (currently soft opening) about 2 weeks ago in Garden Grove offering dining guests specialized Northern Vietnamese cuisine. The dishes are affordable with most menu items priced under $10! What a steal! Portions are shareable and taste is authentic and tastes as if it was homemade. Because it is. Goc Ha Noi Corner not only serves delicious dishes but has some pretty legit drinks as well. The restaurant is offering free drinks for the first 100 customers and bogo deals thereafter for everyone! All meals are 10% as well! My favorite drinks so far are honeydew milk tea, hokkaido cream jasmine tea, , sea salt cream jasmine tea, corn milk (hot), and strawberry lemonade! Below is the drink menu! All reasonably priced at $3 and less. Omg!! Free drinks for the first 100 customers this weekend! Buy 1 get 1 free for all customers after the 100! *How to redeem these deals? Easy! Just follow them on Instagram or like their Facebook page and show the cashier! *Intersection of Dale and Garden Grove Blvd.